With the launch of Adobe's Creative Suite 5.5 upgrade—the debut of a mid-cycle release schedule of its design and development software for creative pros—comes a new twist to Photoshop. Adobe has introduced the Photoshop Touch Software Development Kit (SDK), which will allow developers to create mobile and tablet applications that interact with its flagship image editor over a Wi-Fi connection. The Photoshop Touch SDK, paired with a new scripting engine in Photoshop CS5, paves the way for iOS apps and other platform apps to drive and interact with Photoshop on the desktop. The SDK does not alter the core Photoshop CS5 and CS5 Extended programs, but serves to underscore and extend their major concentration in mobile development. What can developers do with the Photoshop Touch SDK? Adobe has conveniently used its new toy to develop three initial Photoshop CS5 companion apps for the Apple iPad: Adobe Color Lava for Photoshop, Adobe Eazel for Photoshop, and Adobe Nav for Photoshop. The apps let users create custom color swatches, paint, and drive Photoshop tools from the iPad. Users can employ their fingertips to mix colors on the iPad, creating custom color swatches and themes to transfer back into Photoshop. Adobe Eazel, which uses advanced painting technology, lets digital artists create paintings with their fingertips and introduces a new kind of interaction between "wet" and "dry" paints. These paintings can then be sent directly to Photoshop CS5 for compositing or for further tweaking of the artwork. Adobe Nav is designed to boost workflow efficiency by letting users select and control Photoshop tools using the iPad as an input surface. You can use it to customize the toolbar, browse and zoom in up to 200 percent, open Photoshop files, or create new files. While the first applications available are for the Apple iPad and the iOS, the Photoshop Touch SDK also makes development possible on other devices for other platforms, including Android and BlackBerry PlayBook. Developers can access the free Adobe Photoshop Touch SDK now on the Adobe Developer Center. Current Photoshop CS5 customers can examine the connection to devices by downloading and installing a free patch available on Adobe's Website or via the Adobe Application Manager beginning May 3. Adobe hopes the developer community will take its cue from the first three apps to create a broad range of new apps. Macworld got a sneak peek at the apps. Here's our First Look at Color Lava, Eazel, and Nav. Adobe Color Lava lets you use your fingertips to mix colors on your iPad to create custom swatches and color themes for use with Photoshop artwork and designs. Dab, smudge, and swirl to create unique individual color swatches and five-swatch color themes. You can access your color swatches within Photoshop CS5 via a network connection between your iPad and your computer. You can also interact with Photoshop CS5 in real time by tapping a swatch on your iPad to make it the foreground color in your Photoshop CS5 Color panel—or create a color theme, and then see your colors instantly in the Color panel. Use this to finetune your colors using Hue/Saturation sliders, and view HSB and RGB values. You can mix colors when you’re away from your computer and save them on your iPad to bring into Photoshop CS5 when you connect later. You can also share swatches and color schemes with others by emailing them from the app. Adobe Eazel lets you use your iPad and fingertips to create paintings and then instantly access them in Photoshop CS5. New technology allows digital paint to “dry” over time and you can mix “wet” and “dry” paint to create new color blends. Controls for changing color, opacity, brush size, and other settings appear only when you place all five fingers on the screen. When you're done, send your paintings directly to Photoshop CS5, where they’ll be re-rendered at a higher resolution and saved in any file format you choose. (Photoshop CS5 must be open, and a network connection between your iPad and computer is needed.) You can also save paintings to your iPad Photos app, and then email them as JPEG files to others. Adobe Nav lets you use your iPad as a productivity tool. Activate Photoshop CS5 tools, customize the Photoshop toolbar on your iPad, browse and select open Photoshop files, and carry your files with you. Nav lets you use your fingertips to select Photoshop tools from your iPad screen. You can customize the appearance of the Photoshop toolbar on your iPad screen to make your favorite tools easily accessible. You can save one Adobe Nav toolbar configuration with up to 16 tools. You can browse, reorder, view, and zoom in up to 200 percent on open Photoshop documents on your iPad screen. (To get Photoshop files on your iPad, Photoshop CS5 must be open, and a network connection between your iPad and computer is needed.) Tap any open Photoshop document on your iPad to make it the active document in Photoshop CS5. Take your iPad on the go to share and review files with colleagues and clients. The Adobe Eazel, Adobe Color Lava, and Adobe Nav applications for Photoshop will be available in early May for $5, $3, and $2 respectively at the iTunes Store. More information, or to sign up to be notified when the apps become available for purchase, is available from Adobe's Website. 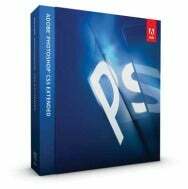 Adobe Photoshop CS5 and CS5 Extended are available through Adobe Authorized Resellers, the Adobe Store and Adobe Direct Sales. Prices are $699 for Adobe Photoshop and $999 for Photoshop CS5 Extended. With the launch of Adobe Creative Suite 5.5 update, Adobe also announced a new subscription-based pricing plan. With subscription pricing, customers can use Adobe Photoshop for $35 per month and Photoshop Extended for $49 per month.